TONIGHT’S game in Italy provided some thrilling rugby and it was the visitors who took the laurels with a superb second half after it appeared that Benetton were on their way to yet another home win of the current campaign. Munster out-half JJ Hanrahan made it an occasion to remember. Not alone did he chalk up a century of games in the red shirt but he gave a superb performance that creates a big decision for head coach Johann van Graan when he sits down to name his starting fifteen for next week-end’s Heineken Cup semi-final in Coventry. Benetton led 21-17 at half time with tries from Tommaso Benvenuti and Monty Ioane while Tommaso Allan kicked three penalties and a conversion. Munster tralied 10-0 in the early stages but they kept in touch with tries from Rhys Marshall and Dan Goggin and Hanrahan landed two conversions and a penalty. The second half saw Munster show the spirit that makes them great. A narrow decision by referee Whitehouse and the TMO saw Darren Sweetnam sent to the bin and a penalty try awarded to Treviso and at 28-17 it looked like this was a defining moment in favour of the home side. Munster dug deep, Wycherely made a great break to force a penalty and JJ Hanrahan slotted over to reduce the lead to 28-20. Then came a yellow card for Benetton’s Benvenuti resulting in another three pointer from the boot of the UL Bohemian man and at 28-23, Munster had grabbed back the momentum. A great break by captain Billy Holland opened up the Benetton defence, the ball was moved to the left through the backline and Shane Daly scored his first try at this grade to level this thriller at 28-28, JJ Hanrahan’s difficult conversion pushing Munster in front by two points, 28-30. Munster sealed the win and the bonus point late in the game with a try from Alby Mathewson (pictured) after JJ Hanrahan had made a trademark break to send the New Zealander over near the posts and also add the conversion. It was a disappointing night for the home side who could have given themselves a chance of a place in the knock-outs had they got a victory or indeed some points from this game. 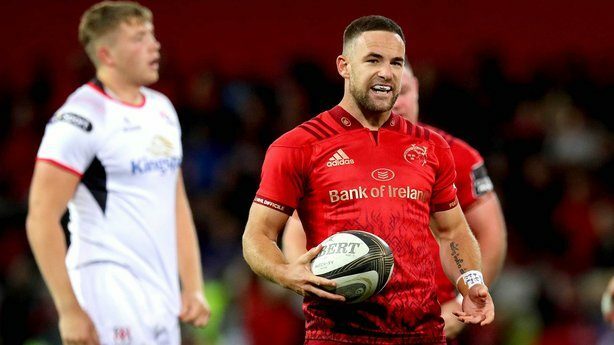 For Munster it was a night when the so-called ‘second string’ came of age after showing that they are waiting in the wings for the chance to prove themselves in future fixtures this season. Scorers – Benetton Rugby: T Benvenuti, M Ioane tries, Penalty try; T Allen con, T Allen 3 pens. Munster: R Marshall, D Goggin, S Daly, A Mathewson tries; JJ Hanrahan 4 cons; JJ Hanrahan 3 pens. Munster: Mike Haley; Darren Sweetnam, Sammy Arnold, Dan Goggin, Shane Daly; JJ Hanrahan, Alby Mathewson; Jeremy Loughman, Rhys Marshall, Stephen Archer; Fineen Wycherley, Billy Holland (C); Jack O’Donoghue, Chris Cloete, Gavin Coombes. Replacements: Kevin O’Byrne, Liam O’Connor, Ciaran Parker, Darren O’Shea, Dave O’Callaghan, Neil Cronin, Bill Johnston, Alex McHenry.